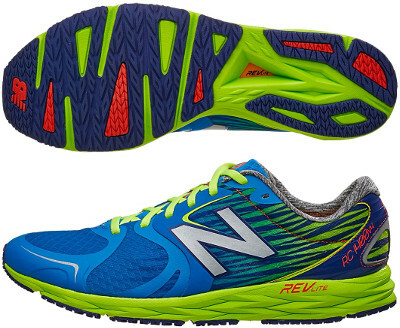 New Balance 1400 v4 are neutral racing running shoes. The eye-candy New Balance 1400 v4 (aka "Silent hunter") is a versatile racing flat with simple construction, good quality materials and some cushioning ready to tackle from speed work and tempo workouts to distances as long as marathon. This fourth edition features additional 2mm of cushion making more suitable for racing long distances. Besides thicker midsole (and therefore weight increase) than in its predecessor 1400 v3, the other major change in 1400 v4 is the new heel counter featuring additional stability. Upper is made of breathable mesh with fused overlays (Fantom Fit) for secure fit and attractive design. Seamless construction and acceptable padded collar make it suitable for sockless running. Well known New Balance's logo is made of reflective material increasing visibility under poor light conditions. The 1400 v4 keeps what is was working fine: REVlite® midsole delivers responsive and light cushioning while blown rubber outsole provides enough grip (even on wet surfaces or tracks) to support fast runs. Outsole design has been reengineered with lateral grooves to increase flexibility for faster toe-off.